For most people, having a toothache is one of the worst experiences in the world. It can take the form of a stabbing pain or a throbbing ache. The most common reasons why a tooth begins to ache can be due to decay about to infect the tooth nerve, a hidden crack about to split the tooth, receding gums which expose the sensitive tooth dentine to the environment, or even gum disease itself which resorbs the bone anchoring the tooth in the mouth. The figure on the lower right depicts a cross-sectional picture of a tooth model showing a crack lying beneath a silver filling, and propagating towards the nerve. If caught in time before any damage to the nerve occurs, most teeth can be repaired. However if the crack or decay reaches the nerve, the only alternatives would be to save the tooth with root canal therapy, or remove the tooth. Hence we recommend six-monthly checkups to prevent any problems before they occur. We Believe in People Power! Any referrals from family, colleagues or friends looking for a friendly local dentist is greatly appreciated. Removing a damaged tooth may seem to be the easiest and less costly option, but over the long-term this can result in difficulty chewing, sloping teeth and uneven biting. Consider replacing the space with a denture, bridge or dental implant! 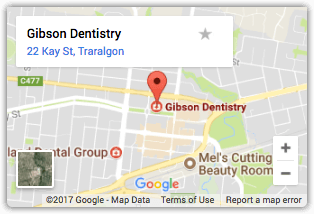 Visit Our Warragul Dental Clinic on Queen St!